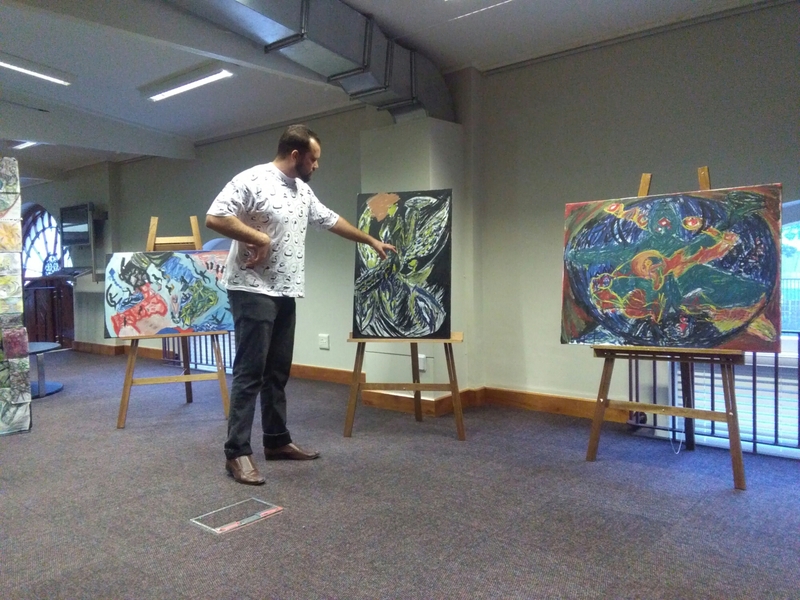 This evening Uriah Cloete took his audience on a journey of discovery and affirmation through his PASSION for Art and the power of the mind. 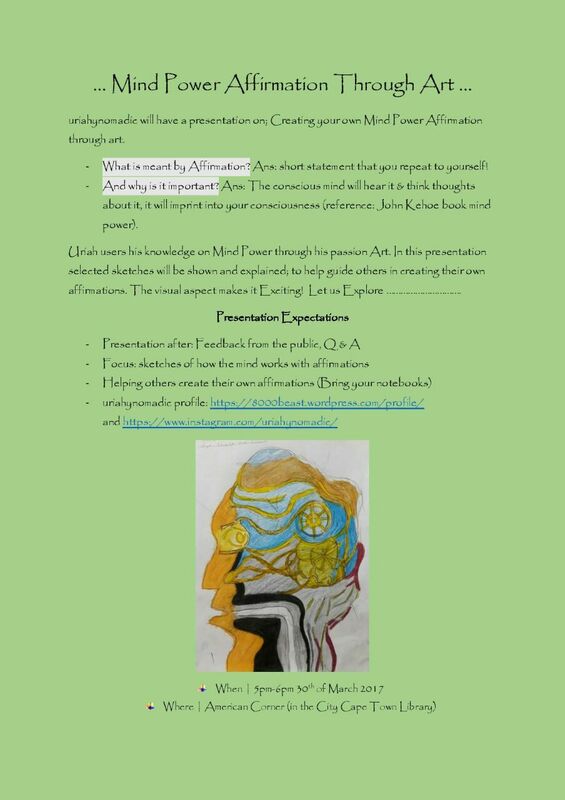 The presentation explored the concept of affirmation inviting the audience to visualize themselves being GREAT infact being THE BEST version of themselves and taking in the present moment as this one moment is all it takes to shine. 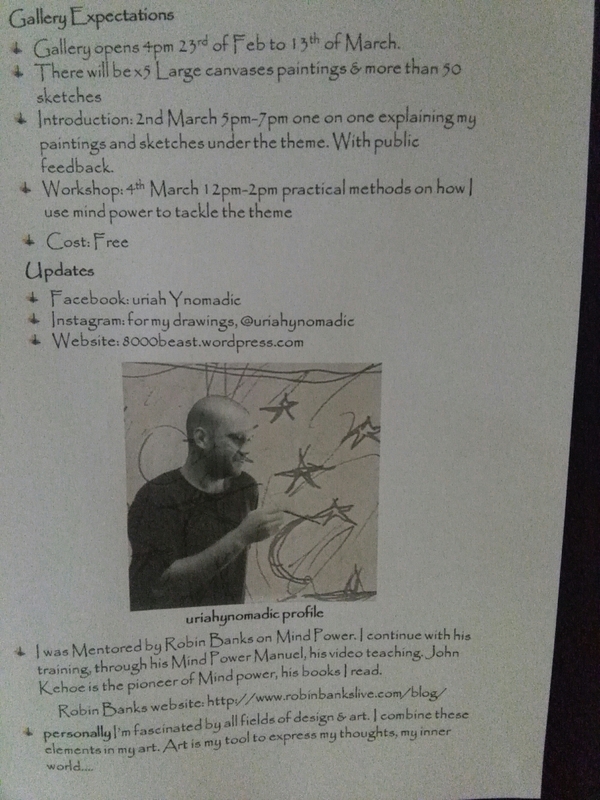 The presentation was interesting and engaging, the audience participation brought about interesting conversations and emphasized the need for empowering yourself through POSITIVE AFFIRMATION, in a simple 3 step process we are able to take what we learnt tonight and apply this in our daily lives…. …who knows what AMAZING things might happen. 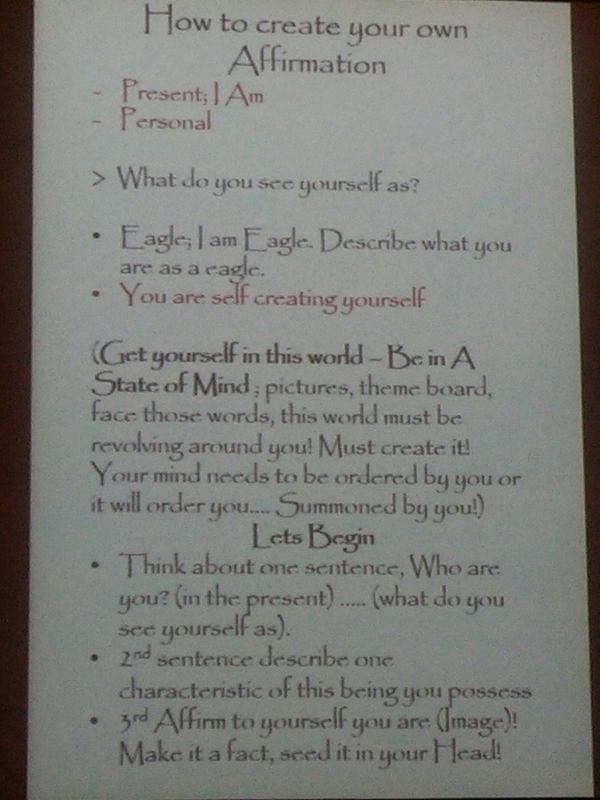 During the the practical element of the presentation I let my mind wander and to answer the question WHO AM I? – 2 visual elements came to mind in the form of a Lion and a Monkey – The Lion is the King, a Leader, fearless and positive. The Monkey is free, adventurous and wild…these are characteristics I see in myself. This is the seed that has been planted in my mind tonight, through visualization, repetition and focus I WILL roar like a Lion and be FREE like a Monkey…..my time is NOW!!! I encourage you to follow Uriah, details in the first picture and join the journey unlocking the POTENTIAL that is inside YOU. This entry was posted in Uncategorized on March 30, 2017 by shaunjengel. 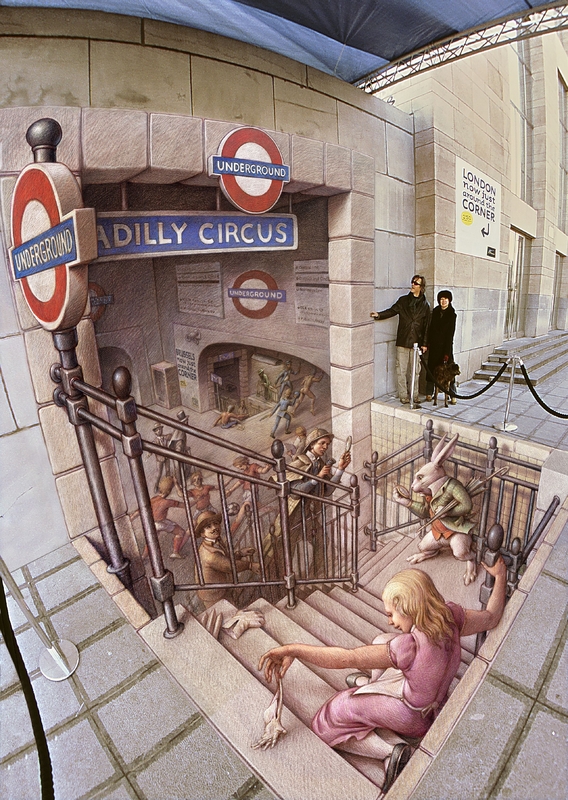 Kurt Wenner, the internationally acclaimed 3D artist and inventor of this fun and spectacular type of artwork as seen on pavements around the world, will be opening his “Incredible Illusions” exhibition on 4 April 2017 at the V&A Waterfront Watershed. It will close on 23 July 2017. Commonly known as 3D interactive pavement art, the pieces on exhibition are completely interactive and educational – a concept very different from the general idea that is given at conventional museum of no touching, no photographing. In fact we encourage you to take pictures of your experience and share on Facebook, Twitter and Instagram. 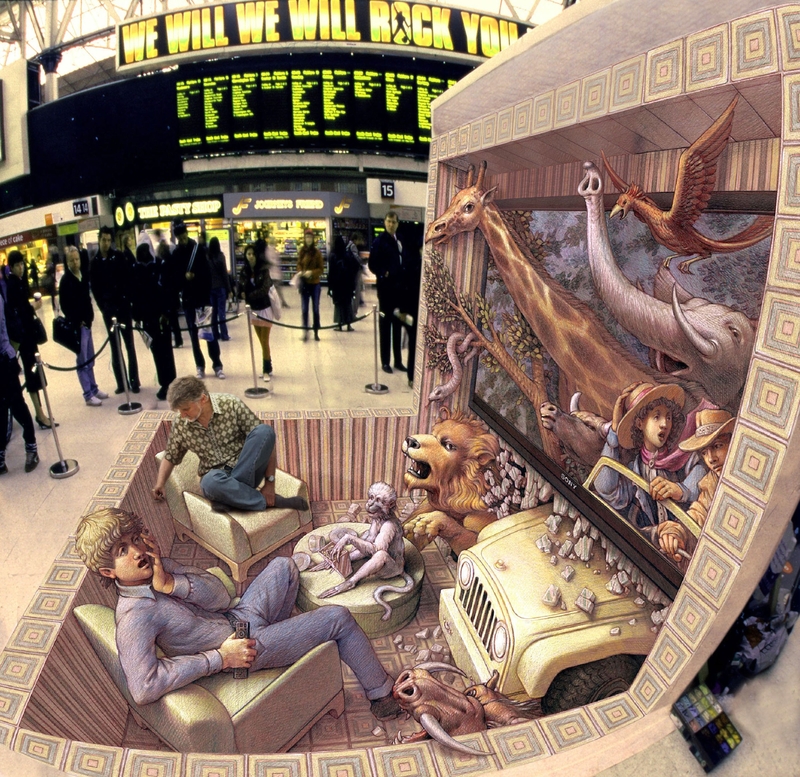 Wenner was inspired by anamorphic perspective, but had to invent an entirely new geometry in order to create his astonishing 3D pavement art images. Kurt Wenner produced his first commissioned mural at the age of sixteen and within a year he was earning his living as a graphic artist. He attended both Rhode Island School of Design and Art Center College of Design, before working for NASA. While at NASA Wenner worked as an advanced scientific illustrator, creating conceptual paintings of future space projects and extraterrestrial landscapes. After participating in countless festivals, Wenner returned to fine art painting on commission and also created sculptures, decorative stucco relief, ceramic murals, architectural designs, and numerous images for publicity and advertising. 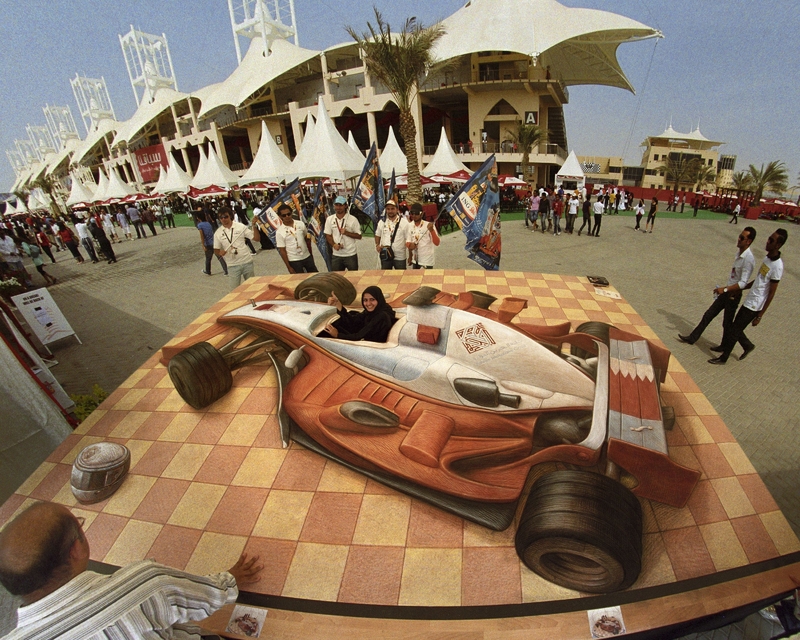 Kurt Wenner’s latest creation is his book Asphalt Renaissance, which documents the history of pavement art and his role in transforming it from a dying tradition to a dynamic multi-dimensional art form. The exhibition includes an educational zone that shares the history of Pavement Art and how geometry plays a pivotal role 3D painting, immersive and interactive art pieces. To conclude your experience there is a “Art Jamming” zone where visitors can learn the basics of 3D painting and express themselves. The paint used is nontoxic but beware it is near impossible to remove from clothing. To assist we will provide a complimentary apron. Great World Exhibitions – South Africa’s leading promoter and presenter of internationally acclaimed touring exhibitions. A proven track record and exclusive focus on delivering touring exhibitions reassure visitors partners of a professional service. The company mission is to entertain, educate and inspire South Africans. This is achieved showcasing the most exceptional and innovative exhibitions. Since 2012, Great World Exhibitions has successfully promoted numerous international exhibitions including the world-renowned BODY WORLDS, Da Vinci – The Genius and TUTANKHAMUN – His Tomb and His Treasures. Is a South African based artists and events management company with offices in Johannesburg, Dubai and Bangkok. 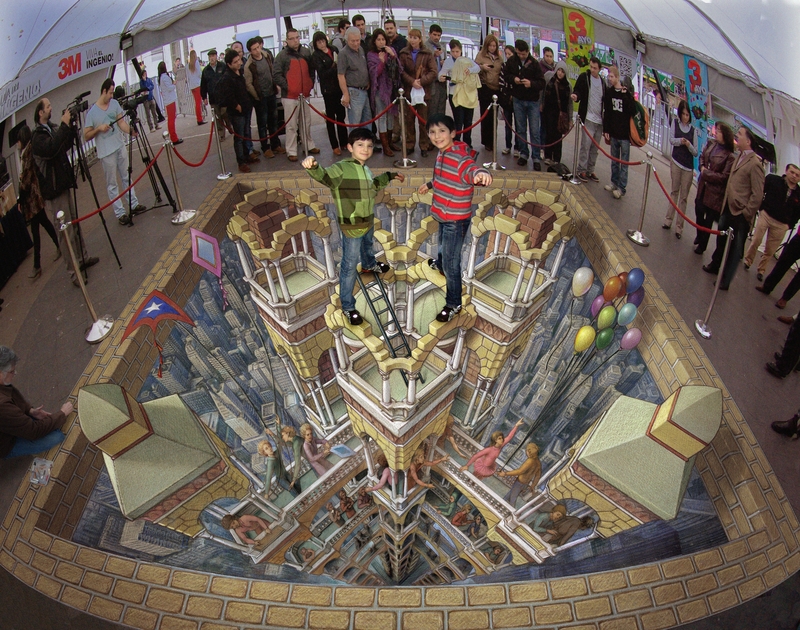 The company manages and promotes the global works of 3D painters, Kurt Wenner, Leon Keer, Juandres Vera, Dazer, Fanakapan, Adry Del Rocio, Julie Kirk Purcell and Australian painters Rudy Kistler and Jenny McCracken .The company is a leading experiential events specialist providing art and event managements services for companies such as Hyundai (Veloster launch), Telkom (Free Yourself campaign), Deerfields, JBR and Dubai walk. It is also currently assisting the launch of the Porsche Panamera in UAE, Morocco, Jordan and India. Dubai Canvas, which is curated by Ticket to the Moon is the largest 3d street art festival in the world and is presented annually in Dubai for Brand Dubai. The rise of outdoor urban recreational spaces has enabled city dwellers to experience the world’s busiest cities optimally. Thanks to city gardens, gyms and other leisure facilities that have resulted from private-public partnerships, people are engaging with their surroundings and each other in exciting new ways. One trend that has amplified this change is the evolution of street furniture across the globe. The days of benches being the only prominent fixtures has long been surpassed, making way for creatives to apply not only the latest designs, but technology to enhance these offerings and expand their functionality. With the need of modern city dwellers to always be connected and have their electronic devices ready to use, the answer to this call soon emerged on the streets. “Seat-e” benches were for example installed in Boston, Massachusetts. These trendy seating solutions with plug-points were created to harness solar power, enabling people to conveniently charge their mobile phones while out and about. South Africans in some of the country’s bigger metropoles can also enjoy the convenience of smart benches – thanks to the Isabelo initiative. These solar powered structures offer free Wi-Fi and four cellphone charging ports. Equally beneficial are NRG Street Charge Stations – solar powered structures that can be found from America to Australia. Driven by the passion to give citizens “clean, environmentally friendly power”, the team behind these creations fashioned unobtrusive, clean-cut devices that also offer businesses branding opportunities. The Water Bench took bench design even further. Lauded as “the first prototype in a series of water-conservation solutions”, it was developed by MARS Architects in collaboration with the BMW Guggenheim Lab in Mumbai. The Water Bench, provides both a seating solution as well as a vessel for collecting rainwater during the rainy seasons that could be used to irrigate smaller gardens during drier periods. Although not necessarily seen as street furniture, but nevertheless showing how design and conservation can seamlessly meld together, was a billboard constructed in Peru. Made by students of UTEC and Mayo DraftDCB, this billboard extracted water from the air – the world’s first billboard of this kind to produce portable water by sourcing it from the atmospheric humidity. Several cities embrace the pastimes of their citizens with convenient solutions. Urban property development brand, Blok, initiated a bicycle parking design competition to provide a system on the Sea Point Promenade. The winning design, Blade, resembles blades of grass reaching up from the ground and enables cyclists to simply secure the frame of their bikes to one of the 16 blades with a lock. Several Capetonians in this area are avid cyclers. By giving them a safe place to store their bicycles, they have peace of mind that their rides are secure while they exercise on the Promenade and explore the surrounding restaurants, putt-putt course and shops. In Amsterdam, Pivot Creative, through attaching red metal clips to benches, transformed these ordinary structures into mini-libraries – dubbed “Ruilbank”. Bringing this initiative to life included partnering with newspapers and libraries for reading material for the various benches. By shaping the way the public experience their surroundings through clever structures and improved street furniture, cities can easily inspire their inhabitants to get social and active. Furthermore, designs inspired by a city’s culture will give rise to an environment that invites its citizens to celebrate the streets and all they have to offer. This entry was posted in Uncategorized on March 20, 2017 by shaunjengel. 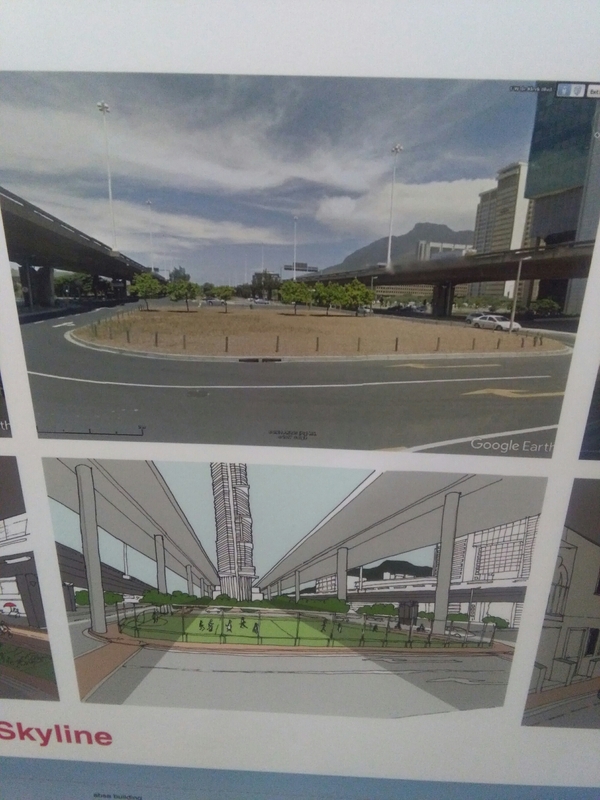 The City of Cape Town set the challenge allowing for proposals on how to deal with the unfinished bridges in CBD and potentially changing the face of the Foreshore. Imagine Cape Town with it’s own version of the Eiffel Tower, futuristic elevated pod cars as modes of public transport, more open spaces and affordable housing within the CBD. 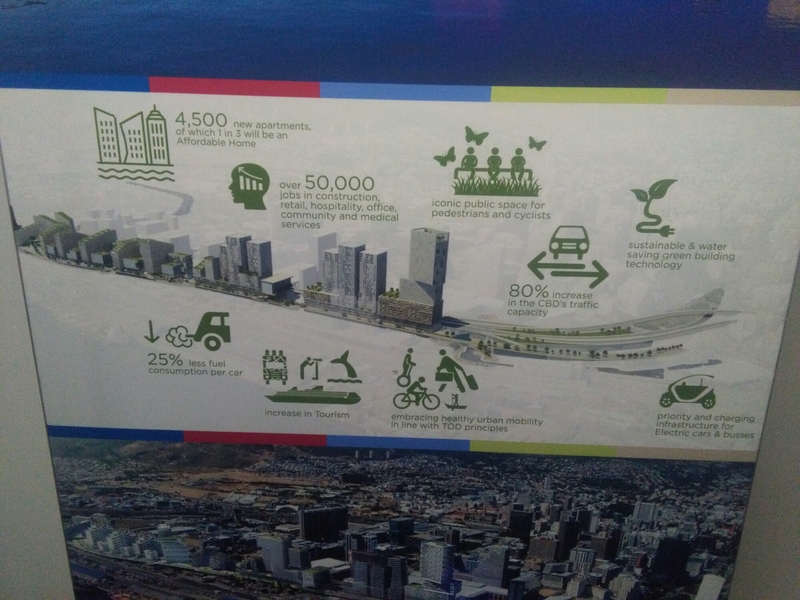 The 6 proposals available for public viewing at the Cape Town Civic Centre gives you the opportunity to have your say and ultimately help choose what the future of the Foreshore will look like. All proposals have the basic elements of reducing traffic congestion and providing affordable housing within the City Centre…I like the idea of promoting the use of public transport and upgrading the current systems, encouraging walking and cycling. I feel if the Trains, MyCiti, Minibus taxi’s and Bus routes are to be upgraded, safety on the routes should also be considered. 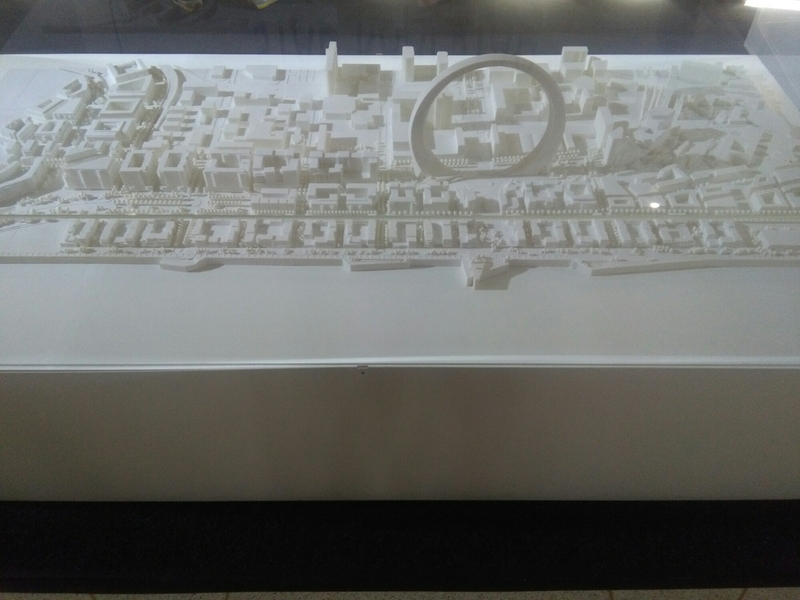 Judging by the proposals put forward the future of the Foreshore looks to be transformed drastically in the coming years…if this creates work opportunities and delivers on the affordable housing and more inclusive city as envisioned I am excited for a clean, greener congestion free CBD. 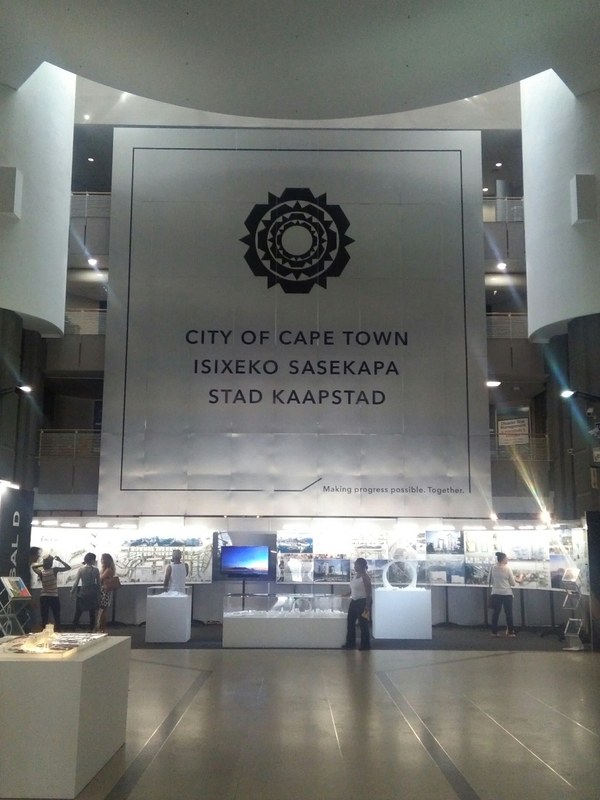 As public lets take this opportunity to be a part of the change, participate, if you are a young person interested this field who knows what other doors will open up by visiting the exhibition and speaking to the people involved…lets work together and Transform Cape Town for All. The exhibition runs until the 21 March 2017 at the Cape Town Civic Centre between 8.30am and 4pm. This entry was posted in Uncategorized on March 12, 2017 by shaunjengel. With artists like David Guetta, Martin Garrix and DJ Snake debuting new music in the country, a large increase in attendance across both cities, and the introduction of the Cape Town Stadium as the Mother City’s home base, it’s safe to say that 2017 was an epic year for the ULTRA South Africa brand. On Friday, February 24, Cape Town Stadium welcomed 18, 000 people through its gates, which was an incredible increase upon the previous year. The new venue proved to be a huge hit with the fans, as acts like Dash Berlin and KSHMR played to the masses on the Main Stage, while Black Coffee and Nic Fanciulli and a whole host of local acts mesmerised the crowd at RESISTANCE. In Johannesburg, Nasrec’s Expo Centre played host to an astonishing 30,000 revellers on Saturday, February 25, making it ULTRA South Africa’s largest one-day attendance to date. Joburg also introduced the Until Until stage, featuring some of South Africa’s hottest hip hop acts and MCs, and the Samsung Galaxy Stage which entertained partygoers from the afternoon until the early hours of the morning. In Cape Town, the international artists came out in full support of the South African event and the local dance music scene, with Martin Garrix visiting the SOS Children’s Village on Thursday 23rd February, and DJ Snake, KSHMR and Nic Fanciulli attending the Bridges for Music Fundraiser on Thursday evening, and playing a large part in raising a significant amount of money for the charity during the course of the evening’s auction. With a hugely successful fourth production officially wrapped and in the books, ULTRA South Africa can now look ahead to hosting its 5th anniversary in 2018. Follow ULTRA SA on Facebook and Twitter for real-time updates on forthcoming events. This entry was posted in Uncategorized on March 7, 2017 by shaunjengel. What the Rich man cannot afford….a mind boggling concept if you think about the fact that in the day and age we live in money buys you everything, right? 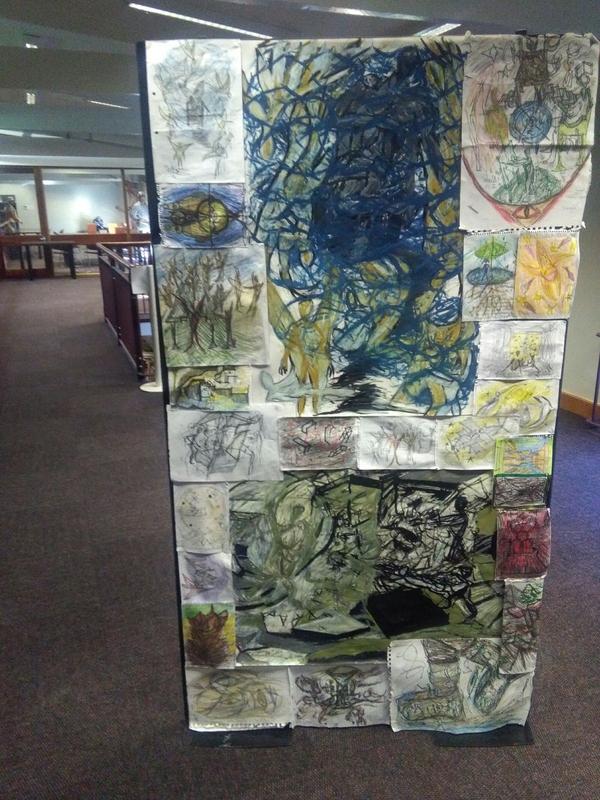 Currently on display at the Cape Town Central Libray, Uriah Cloete unravels this theme through art, he takes us on a journey explaining his thoughts and reminding us that we able to unlock our own potential if we delve deep into our minds and become like a child again. The rich man is focused on the facade of worldly possessions through rigid thinking, losing the sight of the important things in life like family, spiritual upliftment and having fun while you at it. Uriah draws his influence from childhood memories and his passion for unlocking the power of the mind, each piece has a different story…his explanation of not using definitive lines in his paintings is a form of going against the grain allowing the viewer to intepret it in their own way. 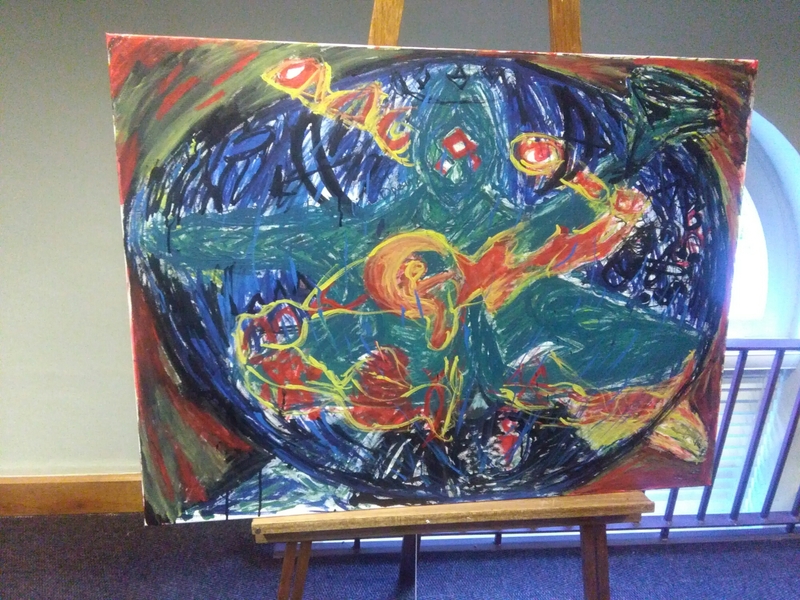 He also wants us to leave with the question of – What is the deeper meaning behind this work of Art? – At least this is how I felt while taking a couple of minutes just examining each piece before he started his presentation. I enjoyed the fact that he adds two vision boards allowing the viewer to see the process of how he got to the final products on display, these sketches makes one appreciate the journey more and if you are afforded the opportunity to meet the man behind the paintings he’ll be more than willing to explain each sketch with deep passion and enthusiasm. 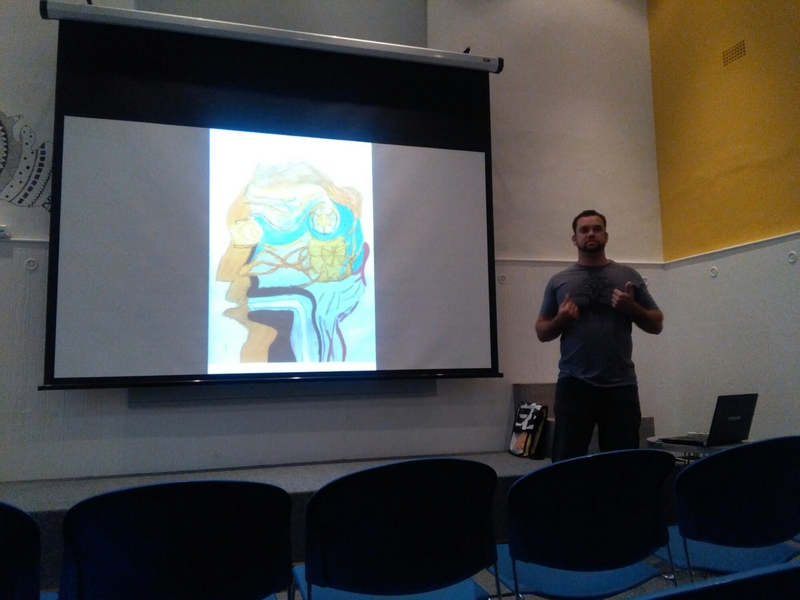 During his presentation he showed us a slide of two characters he created called Wunder Kid and Cat, this fascinated me as it focused on the power of imagination and how we are able to be whatever we want if we visualise our dreams and goals. Just like Wunder Kid and Cat if you want to be on a magic carpet above the clouds, unlock the power of the mind and the world is open to infinite possibilities. 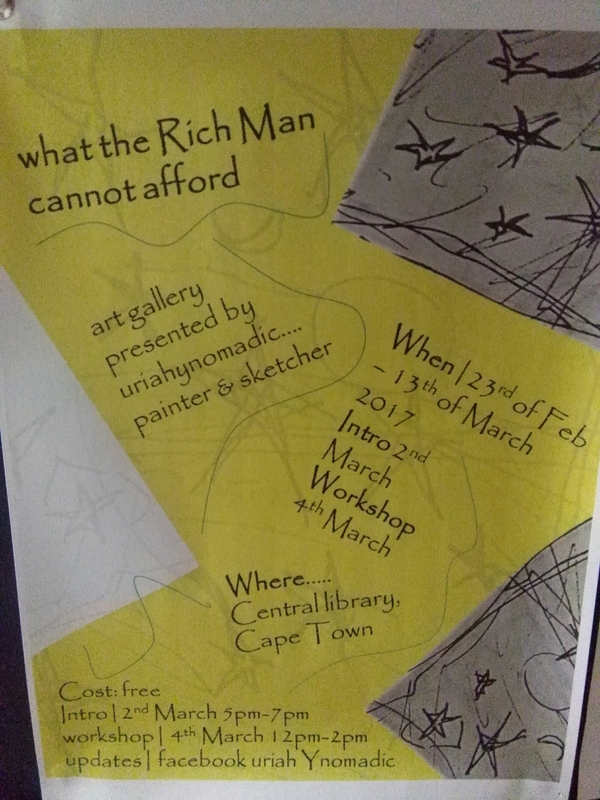 The exhibition is open to the public at the Cape Town Central Library Art section until the 13th March, you can find out more detail about future exhibitions and events by following the details below. This entry was posted in Uncategorized on March 2, 2017 by shaunjengel.